(1) I simply didn’t see it coming. I pride myself on having a good feel as to how the Bears will play on a week-to-week basis and I thought the stage was set Sunday for an overwhelming Bengals victory. Instead the Bears, with a lame duck coach, undermanned offense and injury-plagued defense, delivered their best performance of the season. They were simply great in all three phases and that is a credit to John Fox. (2) Trubisky. Cohen. Howard. Shaheen. Whitehair. Jackson. If you want to know why Ryan Pace isn’t going to be fired, watch the tape of this game. The GM is building a young nucleus through the draft; something the Bears have not done in nearly twenty years. This job will be the best open gig in the NFL come January. (3) Mitch Trubisky’s last two games. 37-47 (79% completed), 373 yards, 2 TDs, 0 INTs and quarterback rating around 115. Okay, so I’m not going to overreact to these two games. I didn’t overreact to some of his struggles so I’m not going to overreact to his terrific play the last two weeks. 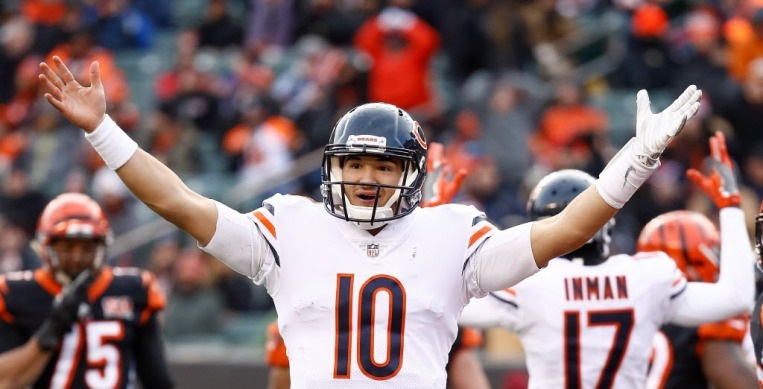 But the thing that should excite Bears fans is the number of players on this roster who are quick to tell media, immediately post-game, how great a leader Trubisky is. Folks, that’s not normal. Rookies don’t command huddles very often. Rookies don’t impress veterans with their attitude and composure very often. This kid has all the intangibles of a great quarterback.